What agronomic traits might the perfect alfalfa variety possess? The laundry list could get pretty long and may slightly vary between individuals, but I’m sure “high yielding” would be at or near the top of most enumerations. Other traits we often see mentioned or evaluated include things such as disease resistance, tolerance to winter injury, persistence, high quality, tolerance to wheel traffic, and insect resistance. Most of these traits circle back and relate directly to additional yield by negating the response from some type of productivity stress. Two other desirable alfalfa characteristics, which are less discussed and evaluated, are yield stability and resilience. Many scientists believe that stability and resilience will be of greater importance as we enter a period with more weather extremes. The thinking, along with climate prediction models, suggest that we will experience more frequent occurrences of both excess and deficit moisture. 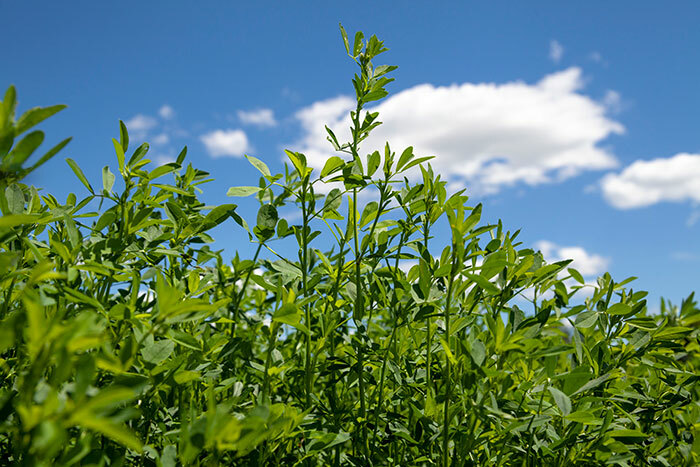 In the March/April 2019 issue of Crop Science, researchers at the University of Wisconsin took a deep dive into the relationship between alfalfa variety (cultivar) productivity, stability, and resilience. The results of the their analysis were somewhat surprising. Productivity – the average yield of an alfalfa variety across normal years (growing seasons). Resilience – the ability of an alfalfa variety to withstand a weather crisis and remain highly productive during that period of stress. Stability – the ability of an alfalfa variety to exhibit minimal yield variability across normal years (growing seasons). Each of these alfalfa characteristics is unique. The researchers wanted to determine how they related to each other and to other known alfalfa variety traits. They used a database that included 1,060 alfalfa variety performance trials conducted at public universities between 1995 and 2013 in 11 states and one Canadian province. The initial database was comprised of 679 alfalfa cultivars. The dataset was then reduced to those locations and trials where a significant crisis year was identified. This enabled the researchers to evaluate resilience during that crisis year. About 80 percent of the crisis years were related to drought. The researchers found that alfalfa variety productivity, resilience, and stability are very different attributes. Varieties that excelled in one characteristic did not necessarily excel in one or both of the others. To phrase this another way, a high-yielding variety may not be either stable or resilient. In fact, productivity was found to be negatively associated with resilience and had no association with stability. The researchers also determined the association of stability and resilience with disease resistance and winter survival ratings. Disease resistance was negatively associated with stability but had no association with resilience. There was also no association found between winter survival index and productivity, stability, or resilience; however, only about 20 percent of the crisis years were not drought related. Given the extended period that the study trials were conducted, the researchers evaluated how variety characteristics changed over time. Not surprisingly, productivity improved with newer varieties. Conversely, stability did not change over time based on the variety’s release date. Whether this is real or not remains unclear as older varieties have more years by which to be evaluated. The researchers found it somewhat troubling that cultivar resilience has declined over time based on the year of variety release. They offered several possible reasons for this finding. It could be due to changes in the frequency of extreme years or because a focus on breeding high-yield varieties has negatively impacted performance in crisis years. Alfalfa variety resilience and stability are difficult to measure, requiring many years or locations to make valid conclusions and incorporate multiple crisis years. More critical is simply the fact that fewer and fewer public universities are conducting alfalfa variety performance trials. As extreme weather events become more frequent, alfalfa’s ability to remain productive in a challenging year grows in importance. Characteristics such as drought tolerance and the ability to survive harsh winters need to be focuses of plant breeding programs. Improvements in plant forage quality features can only be realized if there remains a productive plant to harvest. We still have a lot to learn about the intricate mechanisms that allow for alfalfa survival and productivity. Let’s just hope that the public and private sectors are willing to invest the resources needed to someday develop that elusive perfect alfalfa variety.